The sun has undergone a “complete field reversal,” with its north and south poles changing places as it marks the midpoint of Solar Cycle 24. “A reversal of the sun’s magnetic field is, literally, a big event,” NASA’s Dr. Tony Phillips said in a statement issued on the space agency’s website. “The sun’s polar magnetic fields weaken, go to zero and then emerge again with the opposite polarity. 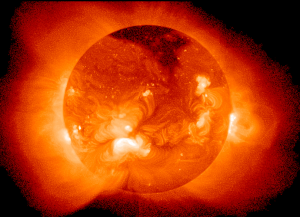 This is a regular part of the solar cycle,” Stanford solar physicist Phil Scherrer explained. While it may seem like the event could have catastrophic repercussions for the galaxy, its effects are actually more subtle, mostly interfering with space exploration. “Cosmic rays are a danger to astronauts and space probes, and some researchers say they might affect the cloudiness and climate of Earth,” said Phillips. Both the aurora borealis and its southern counterpart – the australis – are set to become broader, more frequent, and more visible now that the event has reached its final stage. The impact of the process has been extremely far-reaching. “The domain of the sun’s magnetic influence (also known as the ‘heliosphere’) extends billions of kilometers beyond Pluto. Changes to the field’s polarity ripple all the way out to the Voyager probes, on the doorstep of interstellar space,” Phillips explained. NASA has released a visualization of how the switch occurs. Beginning in 1997 and ending in 2013, it shows the green (positive) polarity switching with the purple (negative) polarity. Solar Cycle 24 has been viewed as quite unpredictable. First, it came late by about a year, with extremely low activity recorded throughout 2009. This prompted astronomers to shift a predicted 2012 peak to 2013. Scientists say the cycle is already among the weakest reported and if the trend continues, the Earth might see another Little Ice Age.